Some things are easier to read than others. When we open a newspaper or a website or a novel, we normally know intuitively what’s going on. We don’t have to labor to understand what the author is trying to say or what literary devices he’s using to communicate his message. But when we try to read the prophetic books of the Old Testament, we’re often waist-deep in a mix of unfamiliar genres with rules and conventions we don’t understand. Add in a few thousand years and a vast cultural difference, and it can be hard to know what to do with these books. As a result, many Christians are intimidated by the idea of reading them devotionally. This is especially true of the “Major Prophets.” We often divide Old Testament prophetic books into “major” prophets (like Jeremiah) and “minor” prophets (like Amos)—not because one is more important than the other, but because of the length of their writing. And that length can add to the difficulty; if reading a minor prophet feels like crossing a river, reading a major prophet can feel like swimming across an ocean. 1. Read in light of the rest of the Old Testament. The prophets aren’t operating in a theological vacuum. They’re reminding the people of Israel of God’s faithfulness as seen in the exodus and calling them to be faithful to God’s covenant—or else experience the exile promised in Deuteronomy. Use what you know of the story of Israel to help you understand what the prophet was saying to the people of his day. 2. Don’t get lost in the details. Unless you have unusual experience and training, some aspects of the prophetic writings won’t be immediately apparent to you. Jeremiah’s audience would understand the significance of the appearance of an almond branch (Jer. 1:11–12), but most of us don’t know that the almond was the first tree to bud in the spring and what that has to do with Jeremiah’s ministry. Don’t get bogged down in these details, but try to look at the context to see what point is being made. Also, a good guide can help you quickly untangle some of these issues. 3. Look for the big themes. On the one hand, the prophets spend a lot of time emphasizing the certainty and horror of God’s judgment against sin. On the other, they proclaim the God-given promise of restoration, forgiveness, and mercy. If you feel lost in the underbrush of confusing imagery, look for one of those two mountain peaks to help you orient yourself as to what’s going on in the passage. All of the Old Testament points to Jesus and teaches us about him (Luke 24:44–47). Sometimes the prophets speak in ways obviously fulfilled in his life, death, and resurrection (Isa. 7:14; 52:13; 53:12). Other times, they paint a picture of the fierce judgment Christ bore for his people on the cross. When you read in the prophets of God’s anger and punishment, remember—and praise God—that those united to Christ by faith need never fear that wrath. What did God want from his people? What form did their obedience (or often, their disobedience) take? What would these words have meant to their original audience? What promises does God make to his people? What does God reveal about his own character? How does God save people in this passage? How does the work of Christ and the power of the Holy Spirit save me from this judgment, secure these promises of God for me, and free me to walk in the obedience that honors the Lord? 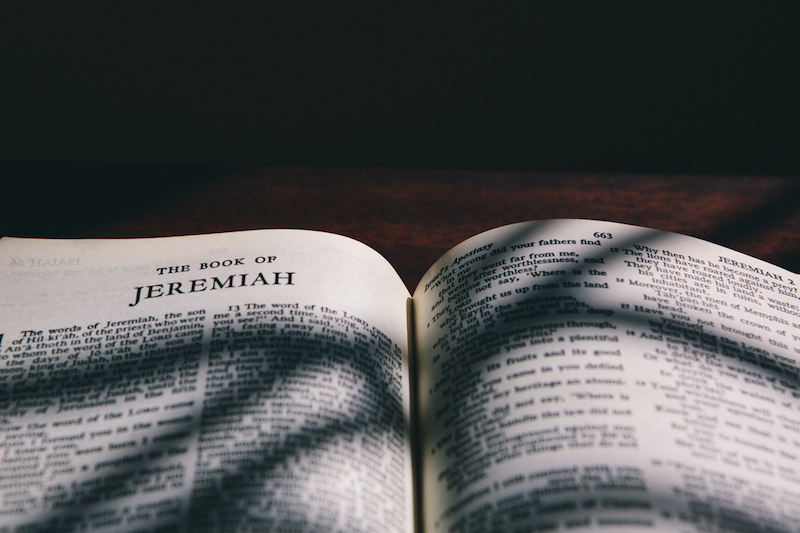 For one example, look at the Lord’s words in Jeremiah 16:1–15. This is the kind of passage that tends to discourage Christians from reading the Major Prophets, with its imagery of dead children (vv. 3–4), bloated corpses being picked apart by wild birds and animals (v. 4), and a God who has removed his peace and mercy from his people (v. 5). It can be hard to know how to reconcile this kind of thing with the tender and merciful picture of Jesus in the New Testament. This prophecy is fulfilled in the various conquests of Judah at the hands of Babylon. The point of the Lord’s speech here doesn’t seem focused on calling people to repentance (as in Jer. 4:1–4) but rather explaining what’s going to happen and how the prophet ought to live in light of that reality (Jer. 16:2). The terrible reality of coming judgment is met with a question about whether God’s anger is justified (v. 10). That’s helpful, since we may well be wrestling with the same question. The Lord explains his wrath by pointing to the persistent idolatry and disobedience of the people, which exceeded that of previous generations (vv. 11–12). Sin is serious, and its consequences are terrible. If we’re repulsed by the Lord’s anger, it’s because we’re not sufficiently repulsed by sin. The threat of exile and death is consistent with the terms of the covenant the Lord made with Israel (see Deut. 28:64–66). So God is being faithful to his promises. He’s not changing the terms of the arrangement midway. Ultimately, the Lord’s final word to his people is one of mercy and grace. Despite his people’s sin, the Lord will restore and deliver them again (vv. 14–15). This is fulfilled initially in the nation’s return from exile (chronicled for us in the book of Ezra). God’s ultimate redemption comes not in the form of a return to the land, but in the death and resurrection of his Son for our sins. Jesus was the opposite of the people of Judah as they’re described in verse 10; he never served another god or failed to keep the Law. Nevertheless, on the cross he took the death we earned by our sin. Verses 4–7 remind us that his body was hung on the cross, exposed to the elements and largely unmourned by the world. He experienced the wrath of God we deserved for our failure to keep the terms of the covenant; we’ll never experience God’s anger, because Jesus took it for us on the cross. Because he rose from the dead, we have new life in him and the sure promise of life in the eternal promised land. In the end, the best way to understand the Major Prophets is simply to invest time in reading them prayerfully. It’s not always easy going, but we can be confident God will enrich our souls when we seek him in his Word. Mike McKinley is the senior pastor of Sterling Park Baptist Church in Sterling, Virginia. He is the author of Church Planting Is for Wimps (Crossway, 2010); Am I Really a Christian? (Crossway, 2011); Did the Devil Make Me Do It? (The Good Book Company, 2013); Passion (The Good Book Company, 2013); and The Resurrection in Your Life (The Good Book Company, 2015). His most recent book, co-authored with Mark Dever, is 90 Days in Ruth, Jeremiah and 1 Corinthians (The Good Book Company, 2016).